Green Wave Grille is highlighted by a whole-muscle meat-carving station. In the arms race to attract recruits to university sports teams, one immediately thinks of heavyweights like the University of Alabama, which recently unveiled a new athletic dining facility that it believes will help nail down commitments while giving its student athletes a venue to get optimum nutritional support. But it’s not just the Alabamas of the world that invest in facilities for their student athletes, as was most recently shown by the opening of a sparkling new athletic dining facility at Tulane University. Tulane may not quite have Alabama’s national prominence when it comes to sports, but it nevertheless takes its responsibilities to its athletic programs just as seriously. 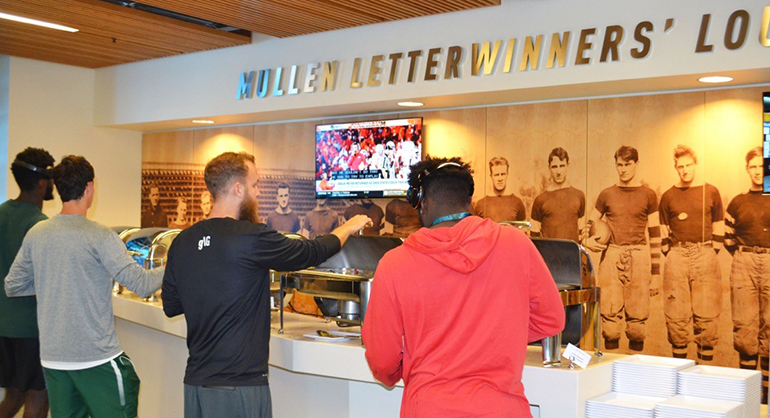 The new dining facility, called Green Wave Grille, is located on the first floor of Yulman Stadium on the school’s New Orleans campus and is designed to equip Tulane’s athletes with proper nutrition, game-ready facilities and opportunities for professional growth and advancement. Operated by campus dining services provider Sodexo, it features protein carving stations, fueling stations, cook-to-order specialty dish stations, as well as travel meals developed by regional Sodexo dietitian Kelsey Rosenbaum and veteran chef Scott Goodstal, who has worked with athletic departments and students for 26 years to ensure their success on the field and in the classroom. The all-you-care-to-eat venue is open to both student-athletes—who are required to dine there—and the rest of the campus community. Boasting a full kitchen, dining areas and prep space, the 14,811-square-foot venue is also available to the entire Tulane community. That is a key consideration as Tulane’s other currently available dining facilities are straining to meet the needs of the campus. Hence, the university has been deploying food trucks and opening new venues in other parts of the campus, including the athletic areas. Round tables encourage interaction, assisting team cohesion. Green Wave Grille is an all-you-care-to-eat dining venue with over a dozen serving stations emphasizing proteins, vegetables, starches, and healthy beverages like water, tea and isotonic drinks. There is a vegan station and a carving station where whole-muscle meats are served in accordance with Sodexo’s Peak Performance concept. What you won't find much of, Maitre stresses, are fried foods or high-sugar sweets, neither of them particularly conducive to high-level athletic performance. Tulane supports 17 scholarship sports involving 380 student athletes and some 150 coaches and staff, with the athletes required to eat at Green Wave Grille not just because of its optimum athlete-focused menu but also as a bonding experience, Maitre notes. The venue is open 7 a.m. to 10 a.m. for breakfast, 11 a.m. to 2 p.m. for lunch and 5 p.m. to 9 p.m. for dinner every day. A satellite grab-and-go Fuel Station operates 5:30 a.m. to 10:30 a.m. and 2 p.m. to 5 p.m. to provide options at the times the full eatery is closed. The majority of diners at Green Wave Grille so far have been athletes as the eatery is located in the part of campus where their activities are concentrated. The 5:30 a.m. opening of the Fuel Station is designed to meet the needs of early-rising runners and others who have to start their daily routines in the pre-dawn hours, for example. However, the rest of the student body is starting to get the message as well as word filters out from the athlete community. “We’ve noticed a lot of our student athletes bringing in their friends for dinner,” Maitre offers. He notes that earlier in the day, the general student body tends to stay in the other parts of the campus where residences and classrooms are located, but in the evening, they are freer to wander. Meanwhile, the athletes generally finish up their training activities in late morning and use the Green Wave Grille for getting lunch. Not that they’d want to, given the general feeling about the quality of the food at Green Wave Grille.